The Tredyffrin Library sent out an email to their contact list stating that the library was closed and all activities cancelled until next Thursday, December 4 due to flooding. 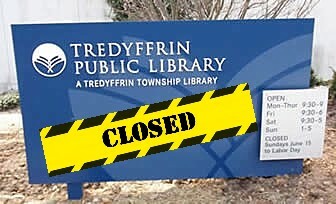 But it appears that the problem is actually worse than just flooding — a visit to to the library’s website www.tredyffrinlibraries.org offers an ominous message from their Board of Trustees, stating that the Tredyffrin Library is over $100K in the red and in danger of service and staffing cuts. Indicating “increased utilities and operating costs” and “decreased funding”, there is a plea for contributions to save the library. Also noted on the website, the Tredyffrin Library Board of Trustees has called an emergency public meeting for Thursday, December 4, 7:30 PM at Tredyffrin Library for a 2015 budget review. I am not certain exactly what is going on — at the Board of Supervisors Meeting a few weeks ago, the Tredyffrin Libraries director Mike Packard presented an update and financial review of the township libraries as part of the township’s 2015 budget discussion. The picture presented was one of continuing library usage, increased selection of programming, higher level of volunteer hours, etc. but no mention of this $100K+ deficit. It appears that the library is in trouble and this new ‘flooding’ issue is only going to make the financial situation worse. When I called the library for an update, the recording said to contact the Paoli Library as they were still operating. If you have materials on hold at Tredyffrin, you may pick them up when the library reopens on December 4. When placing a new hold, please choose another pick up library other than Tredyffrin. No fines will accrue for days that the library is closed. Increased utilities and operating costs combined with decreased funding have resulted in a budget deficit of over $100,000. We are in immediate risk of having to cut valuable services, staff and days of operation in order to balance the budget. 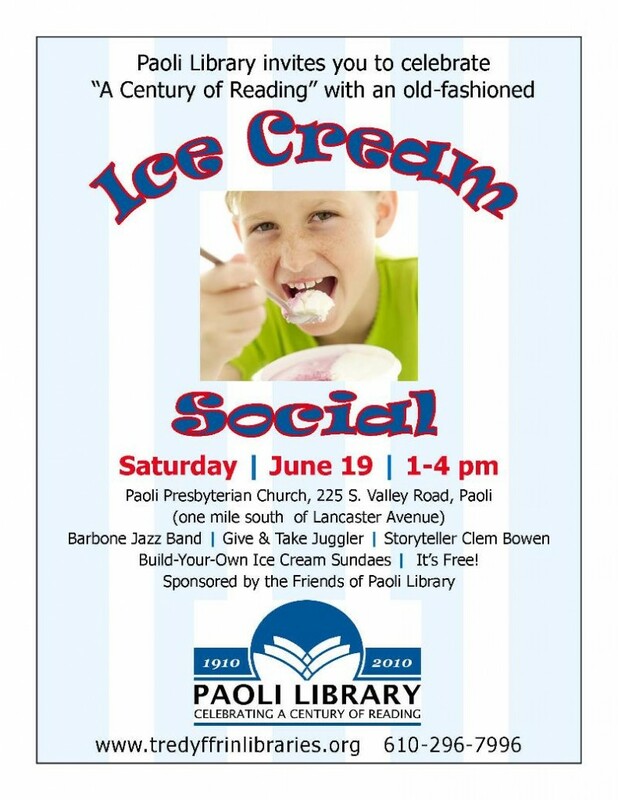 Paoli Library Celebrates 100 Years . . . Ice Cream Social Tomorrow!